A consistent watering schedule with the proper amount of water applied promotes a healthy root system that makes your grass more water efficient and able to withstand greater periods of stress related to variable weather conditions. Applying too much water is wasteful and can make the grass area susceptible to fungus or root related diseases. The frequency of water applied to grass is dependent on the specific soil type the grass is growing in. Sandy soils need more frequent watering then moisture retaining clay soils. Sprinkler zones will typically need to operate 2-3 times a week. Setting the valves in these zones to come on during the week (Monday, Wednesday and/or Friday for example) allows the grass to dry out enough by the weekend so mowing can occur. 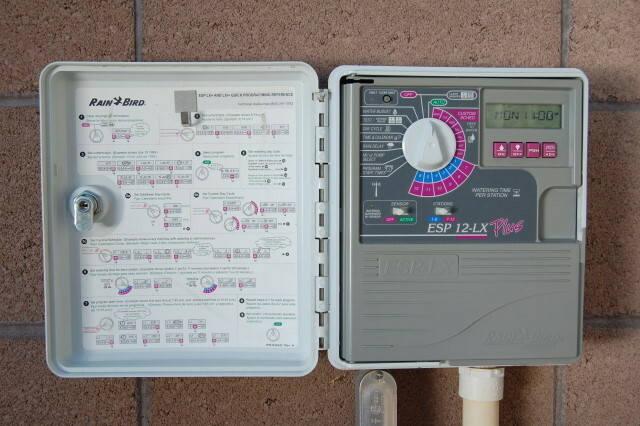 If your controller has a watering schedule card, write down the valve numbers, run and start times and what zones they control, along with what program they are on. This will come in handy when you add the other valves on different programs so the start times do not conflict. Adjust the start time intervals throughout the growing season. It is important for the sprinklers to have nearly the same ‘run time’ during the growing seasons (spring, summer, and fall) but adjust the ‘start times’ to water less frequently in the spring and fall. Most grasses will still need the same quantity of water just not as often. If it becomes evident that too much water is running off the grass and not soaking into the ground it may be necessary to split the time the zone is on into two start times. (Most controllers have multiple start times available. Typically this is for starting seeded lawn. For grass seed to germinate it needs water to be applied frequently, although for a shorter period of time than an established sod lawn). 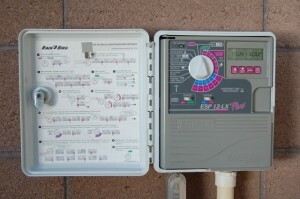 For example: If the valve is on for 12 minutes, reset it to run for 6 minutes. Set a second ‘start time’ to come on an hour later. Re-run the valve for both start times and check to see if water is still running off the grass. If it is, change the second ‘start time’ to a later time.